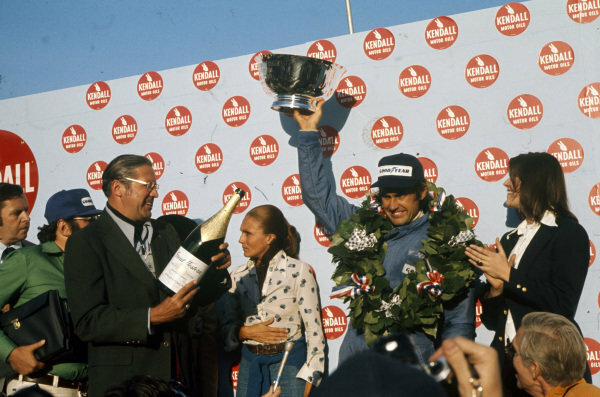 Carlos Reutemann celebrates victory on the podium with Carlos Pace, 2nd position, and James Hunt, 3rd position. 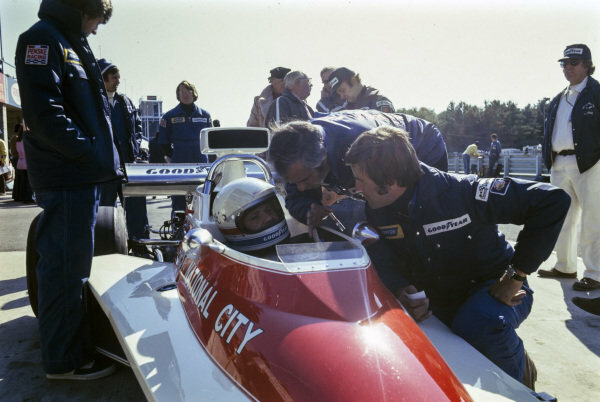 Team boss Roger Penske talking to Mark Donohue in the pits. 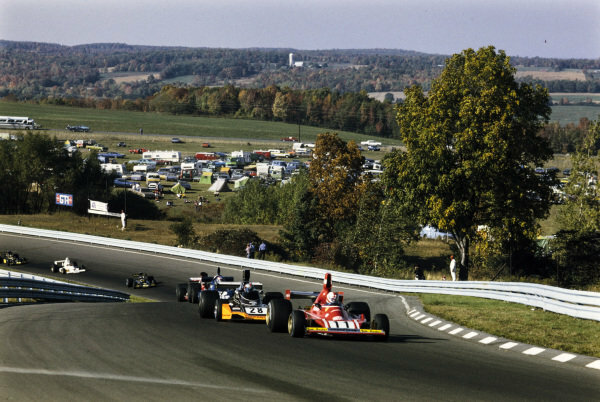 Niki Lauda, Ferrari 312B3 leads Jody Scheckter, Tyrrell 007 Ford and Emerson Fittipaldi, McLaren M23 Ford. 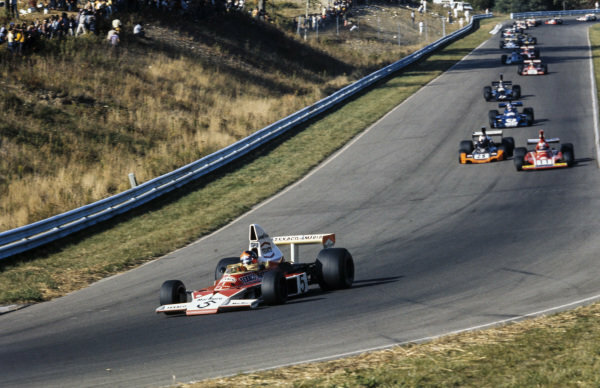 Emerson Fittipaldi, McLaren M23 Ford leads Clay Regazzoni, Ferrari 312B3 and John Watson, Brabham BT44 Ford. 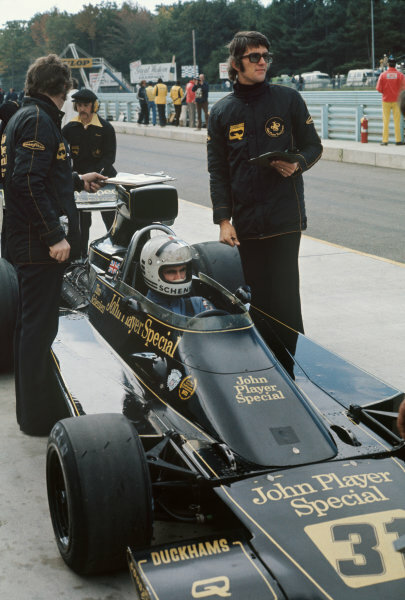 Rolf Stommelen, Lola T370 Ford. 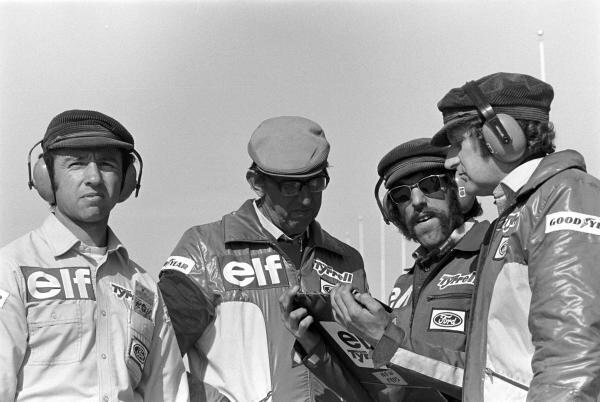 Clay Regazzoni, Ferrari 312B3 leads John Watson, Brabham BT44 Ford and Patrick Depailler, Tyrrell 007 Ford. 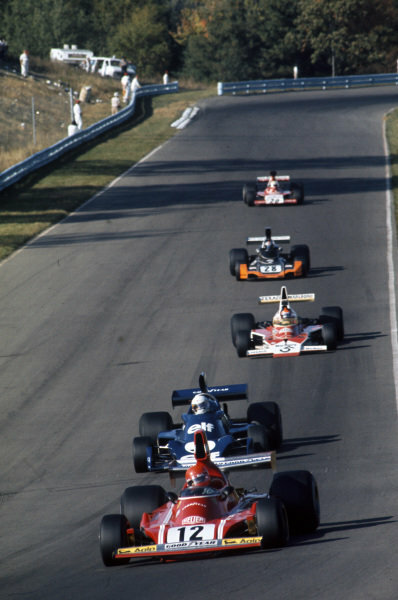 Carlos Pace, Brabham BT44 Ford, leads Niki Lauda, Ferrari 312B3. 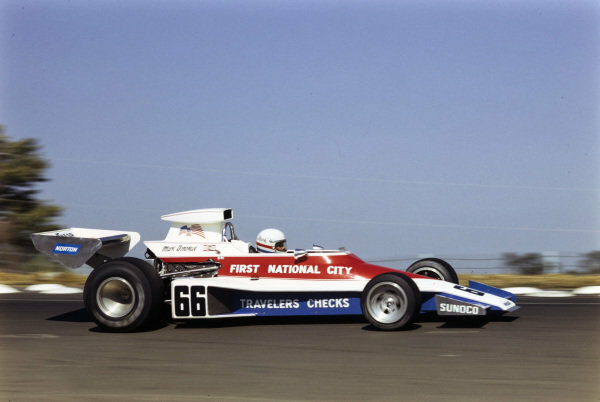 Mark Donohue, Penske PC1 Ford. Watkins Glen, New York, USA. 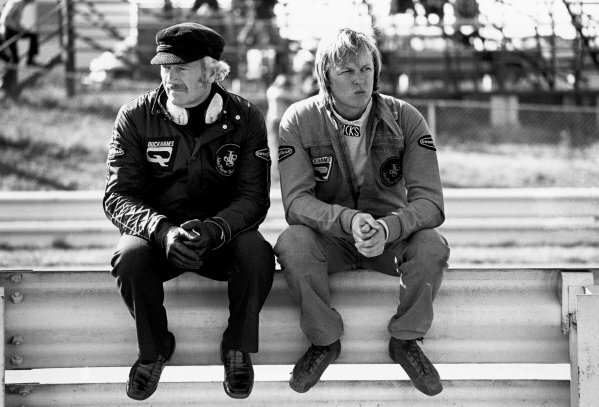 4 - 6 October 1974.<br /> Ronnie Peterson (Lotus 72E-Ford), retired, sits on the armco barrier with team boss Colin Chapman after hearing the death of Helmuth Koinigg, portrait. <br /> World Copyright: LAT Photographic.<br /> Ref: 6870 - 21. Watkins Glen, New York, USA. 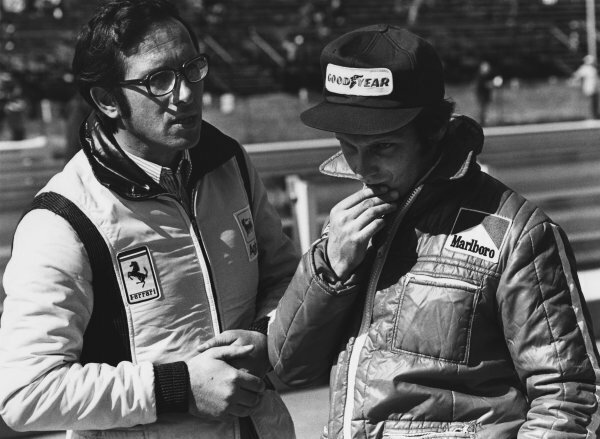 4 - 6 October 1974.<br /> Niki Lauda (Ferrari 312B3), retired, with Mauro Forghieri in the pits, portrait. <br /> World Copyright: LAT Photographic. <br /> Ref: 6871 - 8-8A. 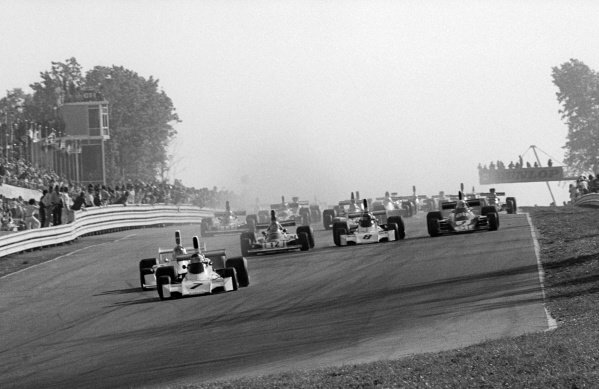 1974 United States Grand Prix East.<br /> Watkins Glen, New York, USA. 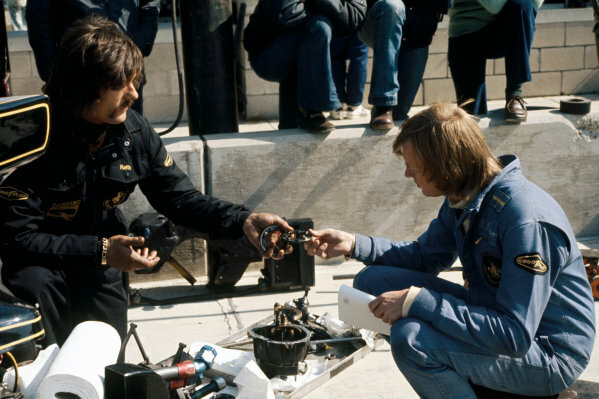 4th - 6th October 1974. 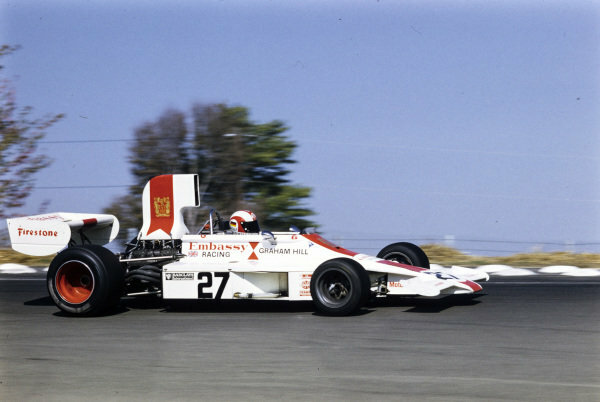 Emerson Fittipaldi (McLaren M23-Ford), 4th position, action. World Copyright: LAT Photographic. 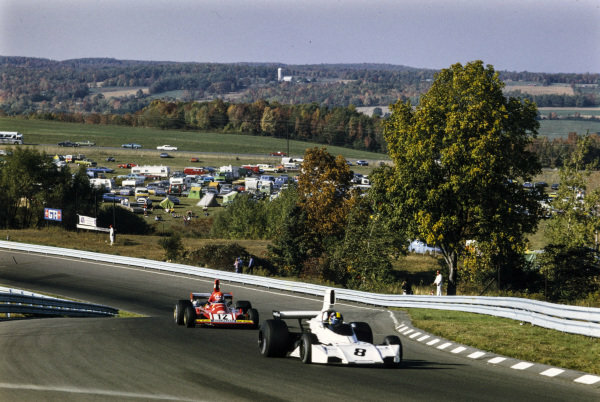 1974 United States Grand Prix East.<br /> Watkins Glen, New York, USA. 4th - 6th October 1974. 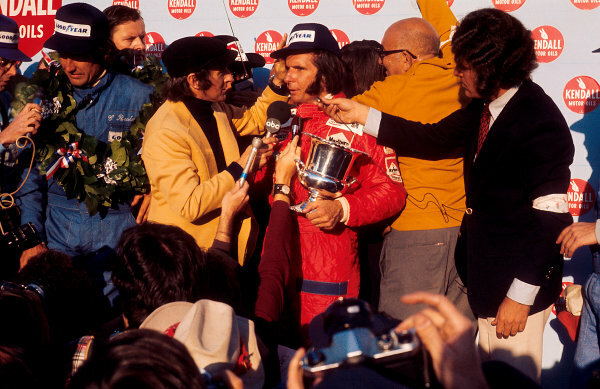 Emerson Fittipaldi (McLaren M23-Ford), 4th position, portrait. 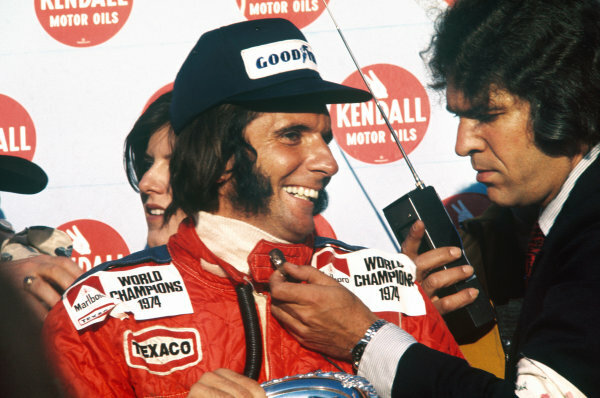 New drivers world champion Emerson Fittipaldi celebrates taking his second world title.World Copyright: LAT Photographic. Ref: 74USA02. 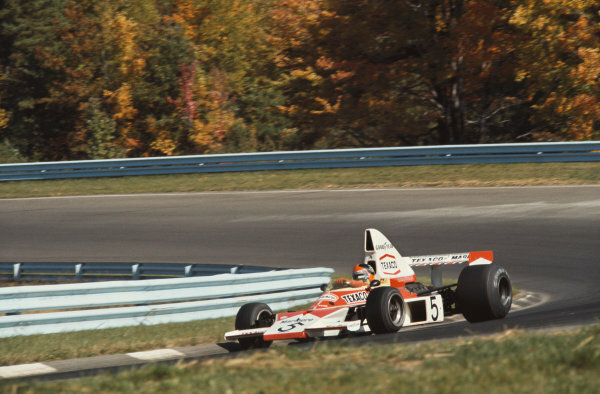 Pole sitter and race winner Carlos Reutemann (ARG) Brabham BT44 leads at the start of the race.<br /> United States Grand Prix, Rd 15, Watkins Glen, USA, 6 October 1974. 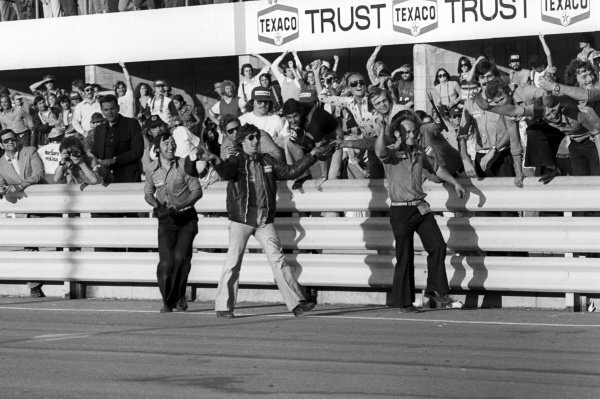 The Brabham team celebrate at the end of the race as winner Carlos Reutemann (ARG) and his team mate Carlos Pace (BRA) secure a 1-2 finish for the team.<br /> United States Grand Prix, Rd 15, Watkins Glen, USA, 6 October 1974. 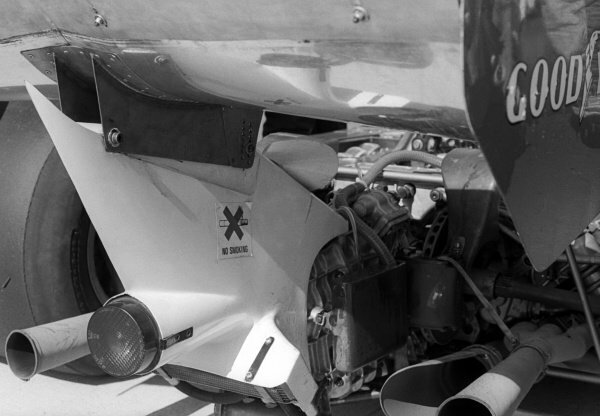 A no smoking sign near the engine of a Ferrari 312B3.<br /> United States Grand Prix, Rd 15, Watkins Glen, USA, 6 October 1974. 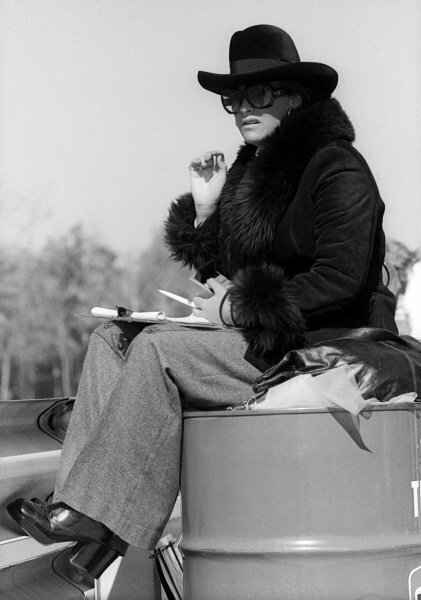 Maria-Helena Fittipaldi (BRA) was on hand to watch her husband Emerson Fittipaldi (BRA) McLaren, clinch his second World Championship crown.<br /> United States Grand Prix, Rd 15, Watkins Glen, USA, 6 October 1974. 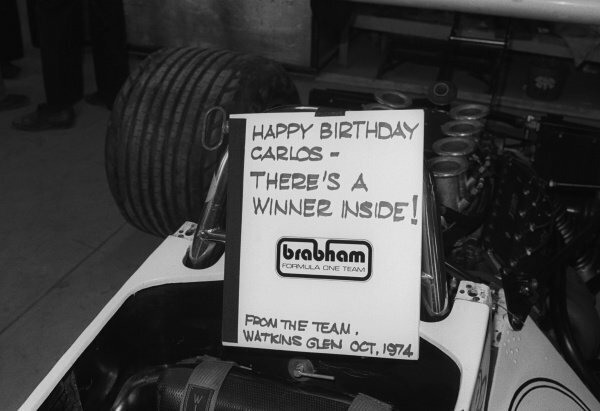 A note from the Brabham team for Carlos Pace (BRA), who celebrated his thirtieth birthday with second place rather than the victory the team predicted. 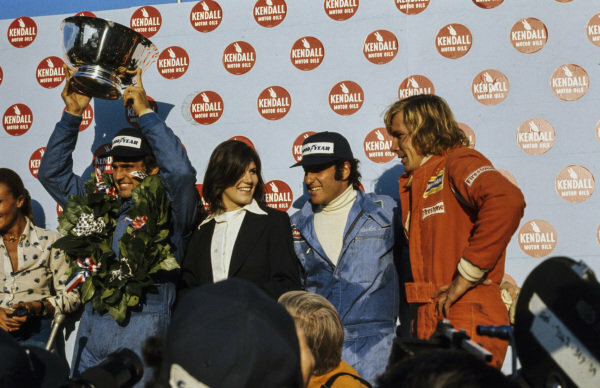 Team mate Carlos Reutemann (ARG) took victory in the final GP of the season instead.<br /> United States Grand Prix, Rd 15, Watkins Glen, USA, 6 October 1974. 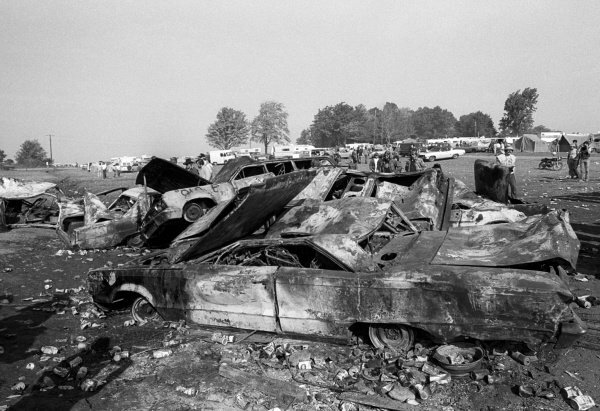 Burnt-out exhibits from the infamous Bog.<br /> United States Grand Prix, Rd 15, Watkins Glen, USA, 6 October 1974. 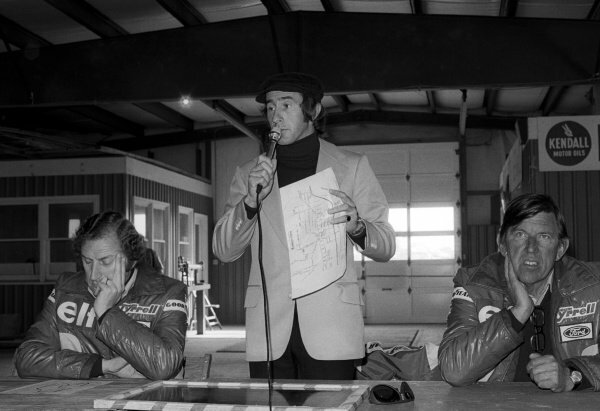 Jackie Stewart (GBR) gave another of his Elf circuit presentations to the media, with Derek Gardner (GBR) Tyrrell Designer (Left) and Ken Tyrrell (GBR) Tyrrell Team Owner (Right) listening in.<br /> United States Grand Prix, Rd 15, Watkins Glen, USA, 6 October 1974.